IONIA, Mich. (AP) — An intense manhunt was underway Monday for a convicted killer who peeled a hole in two fences with his hands to escape from a Michigan prison before abducting a woman and fleeing to Indiana where the victim and her vehicle were safely recovered, authorities said. Officials were stunned by the brazen escape Sunday night of Michael David Elliot, who had a record of good behavior during his 20 years in custody. He wore a white civilian kitchen uniform to evade security and blend in with snow at the Ionia Correctional Facility in western Michigan, prisons spokesman Russ Marlan said. Prison fences were equipped with motion sensors to alert guards. The fences also carry electric current to shock anyone that touches them. "It appears that did not happen. ... He was not zapped with electricity, and he was not picked up by the motion sensors," Marlan said. Once outside the prison in Ionia, Elliot, 40, abducted a woman and stole her Jeep. 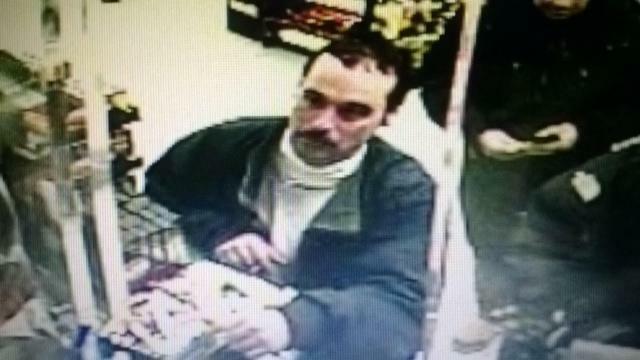 She escaped late Sunday when he stopped for gas in Middlebury, Ind., some 100 miles to the south. The woman's red Jeep was found abandoned nearby in Shipshewana on Monday. At least one school was locked down, residents were warned to stay inside and officers went door-to-door in the area. But it is possible Elliott was long gone. Investigators learned that the Jeep had been parked for hours before it was reported, said Indiana State Police Sgt. Ron Galaviz. "We can't assume that he's on foot," Galaviz said, noting the cold weather, "but we can't always assume he's going to be in a vehicle." An alert was issued to law enforcement nationwide. The woman told police that Elliot was armed with a box cutter and a hammer and had said he wanted to get as far from the Michigan prison as possible. "We had dog teams. We had a helicopter from the state police," said Michigan Corrections Department Director Dan Heyns. "The response was good, but he'd left the area by the time we were mobilized totally 100 percent. It didn't take him long to get down to Indiana. ... His flight path now has expanded dramatically." Nothing in Elliot's record suggested he might escape, said Heyns, who added, "This is entirely a one-man operation." The woman who was abducted was able to call 911 from a concealed cellphone while Elliott was pumping gas at the store near Middlebury in Elkhart County, Ind., authorities said. She ran to a restroom and locked herself inside. Elliot knocked on the door, but she stayed inside until police arrived. Elliot was discovered missing from the prison about 9:30 p.m. Sunday, probably 2 ½ hours after he escaped by using his hands to create a hole in two fences, Marlan said. "There was a perimeter vehicle with an armed officer who was circling the facility during this time period. (Elliot) was able to evade or avoid detection," Marlan said. He said it wasn't immediately known if electronic security measures at the fence were not working or if Elliot somehow avoided them. Elliot was serving life in prison without parole for fatally shooting four people and burning down their Gladwin County house in 1993 when he was 20 years old, according to court records. Elliot and his accomplices were trying to steal money from a drug dealer, police said. He was arrested a few days later and had a gun that tied him to the slayings. One of Elliot's co-defendants testified against him, saying he laughed about shooting the victims in the head. Elliot was convicted of first-degree murder in 1994.